A newly-published Apple patent application hints at the possibility of a charging case for the Apple Watch that could also hold spare bands —and even charge those bands, if they're enhanced with special features. Titled "Case for wearable electronic device," the application describes a product that could "securely hold and store a portable electronic device, such as a wrist-worn or other wearable electronic device, along with one or more bands that can be used with the device." The ability to charge bands is described as one potential embodiment. The accessory might also be designed to accommodate bands of different widths, lengths, and thicknesses —an important factor given official bands like the Link Bracelets and the Hermes-branded Double Tours. Apple has periodically been thought to be working on electronically-enhanced Watch bands, or support for them, but none have so far come to fruitition. The company has even shut down attempts by third parties to take advantage of a hidden port on the Watch. Enhanced bands would be a way of quickly adding new options, including medical sensors that require U.S. Food and Drug Administration approval and might otherwise force Apple to submit entire Watch models for review. Apple appears to be working towards enhancing the Watch's onboard sensors, perhaps adding an EKG monitor, and in the long run, a non-invasive glucose reader. That reader is thought to be "years away" however, since it's a holy grail for glucose readers in general. As with many of Apple's patent applications in the past, the product may never be developed, nor seen again. 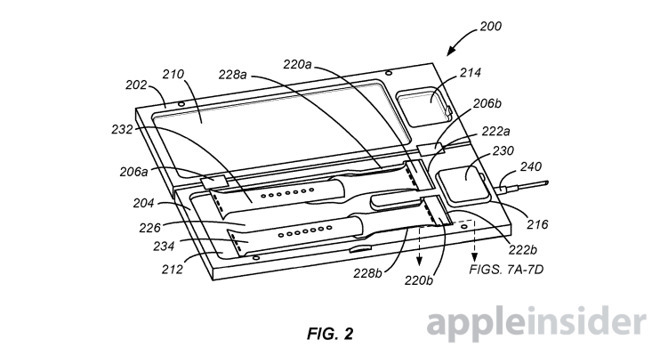 The accuracy of predicting Apple's future moves based solely on patent filings is very poor.